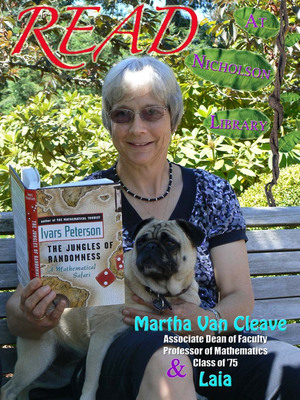 Martha VanCleave, Associate Dean of Faculty and Professor of Mathematics, class of 1975, with Laia, reading The Jungles of Randomness: A Mathematical Safari, by Ivars Peterson. Terry, Paula and Nicholson Library Staff, "Martha VanCleave READ Poster" (2010). READ Poster Gallery. Image. Submission 77.